David Winter was born in 1958. His mother was well known sculptress Faith Winter, and it was in her studios that David developed his creative skills. Initially, he made pottery and decorative tiles, and then on a joint venture with John Hine, David started making heraldic shields. Pictured left is First Born which was the first complimentary membership piece from The Friends of David Winter who took over production of cottages for a short while from 2003. These were not successful but proved useful in attracting David to design on a minute scale. He and John experimented and in 1979 the first David Winter Cottage – ‘The Mill House’ was produced. The cottage quickly sold out. Production began in the coal shed at the foot of David’s parents’ house. John Hine handled the marketing and sales; David did the sculpting. The cottages proved popular from the onset, and in 1981 larger premises were found at Borden, and then later in Eggars Hill. The company grew fast and there a great interest in the cottages in the US. In 1988 David Winter Cottages were awarded the “Collectible of the Year”, the same year the Company was awarded the Queen’s Award for Export. In December 1993, John Hine Limited was sold in part to Media Arts Group Incorporated (MAGI), and later MAGI bought the remainder of the company. During the height of their popularity David Winter Cottages were fetching many times their initial sale value on the secondary market. Extremely rare pieces such as Sabrina’s Cottage and Wintershill were selling for fecthing over £1000 ($2000) during the early 1990s. 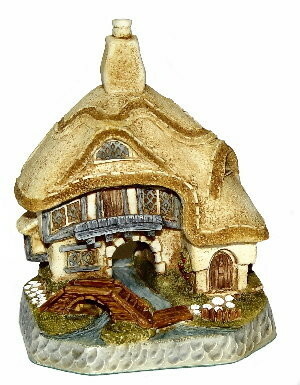 During 1997, and after considerable upheaval, ENESCO took over the production and distribution of the cottages until the end of 2002. In 2003 The Friends of David Winter took on production for a while.